Hong Kong is a beautiful and busy metropolis with very little lacking, except that there aren't many teddy bear makers there. Thankfully, Hong Kong has Hilda Ng. Hilda, of Teddy Village, has taken her passion for creating things, with a needle in her hand and turned it into a business that feeds her soul. 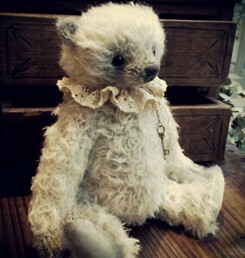 "I love one-of-a-kind, handcrafted, vintage, antiques especially antique teddy bears," she confided. Hilda has been making teddy bears for almost 10 years and finds that her dog, a Chow Chow named Boyboy, is a great inspiration when creating her bears. "He alway has a sad look on his face and that makes me want to hug him!" Maybe he just needs a teddy bear friend. Hilda makes teddy bears for a living. "I can work and enjoy my hobby at the same time!" she exclaimed. 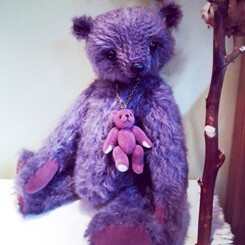 Each month she produces around four handcrafted teddy bears; each of them designed and crafted using the highest quality materials such as German and English mohair and glass eyes. She often finished them with embroidered waxed noses and hand painted facial details. 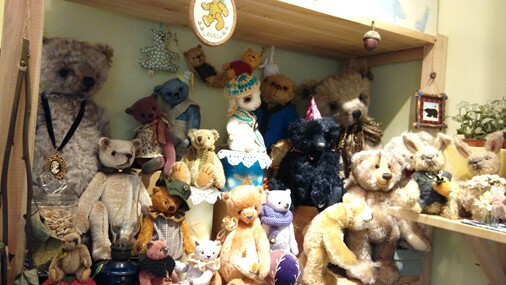 Most of the teddy bears are made in vintage and antique styles designed from her own pattern as well. 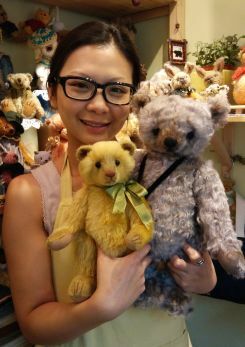 With few teddy bear makers in Hong Kong, Hilda teaches teddy bear making by offering courses from begin to advanced level students. 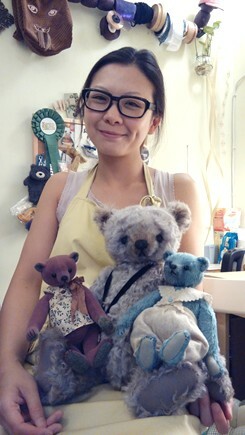 "I love teaching fellow bear lovers how to create their own one of a kind bears." 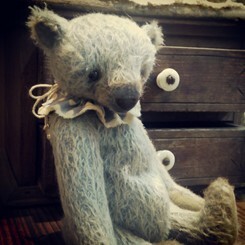 In addition to making bears, Hilda offers repair services, sometimes remaking the bear from an existing pattern. 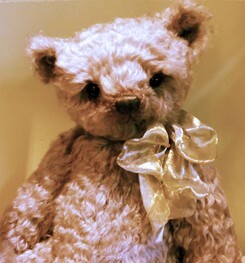 "A most remarkable customer brought a teddy bear that was over 40 years old to me to have remade as a birthday gift for her husband. 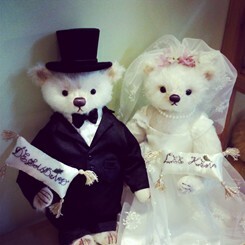 The bear (named Johnny) used to be her husband's childhood best friend. However, as the years passed, Johnny's hair had fallen out and the joints had become loose, so he was brought to me to remake." 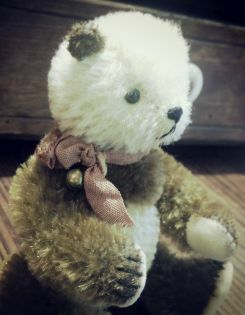 It took about 30 days, from the time of disassembling, to copying the pattern and sewing, until the little bear was reborn. 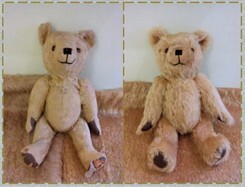 "I had a great experience with the customer on choosing the right mohair and eye colors, and I also gained experience on a true vintage teddy bear." 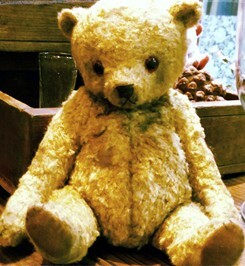 When the husband saw the reborn teddy bear, he was very impressed and treated the bear like the most precious gift he ever had now; that Johnny was back with him and had brought back so many good memories. 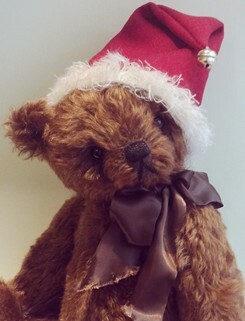 That is Hilda's wish for all her bears; that each one can find a warm, loving home to go to.